Oblo is going to host the very first workshop in an open studio format! 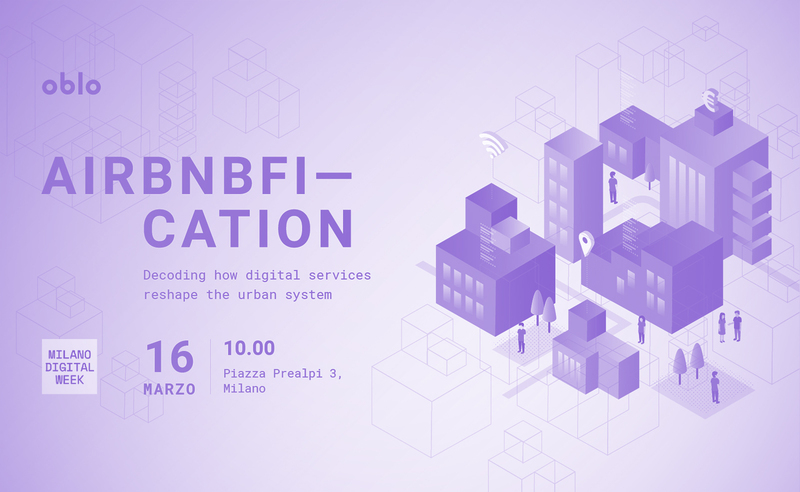 The Milan Digital Week provided the inspiration to propose a reflection on the topic of Urban Intelligence: can service designers break down the surface of a digital service and its visible interactions to achieve deeper levels of understanding and improvement of the overall system connected to that interface? The morning will start with Yulya Besplemennova and Chiara Albanesi introducing the theme and some case studies, to then experiment all together the use of a multi-layered system map to look at the interactions between interfaces, cloud, city, state, the Earth itself and, of course, users. The map has been created by oblo, with the help of Aishwarya and Saloni from the Master of Strategic Design (Politecnico di Milano). Effective service design doesn’t happen in the office of a creative agency; it takes place close to the context of service use and execution. It’s a collaborative process that engages all the relevant roles involved in the service experience to co-create solutions, a process in which the designer becomes a tool in the hands of both organisations and users to achieve their goals. Roberta is participating to Doers, the first Central-Europe Service Design Conference, to discuss the impact of service design as a co-creation journey through a set of stories across public and private sectors, analog and digital experiences, different industries and geographies. After one year of work, calls, spreadsheets and trips to Lyon it's almost time for the Interaction 18 week to begin! Roberta partnered with Gilles Demarty and a large group of interaction designers and volunteers from all over Europe to shape three intense days of sharing and learning. The conference is going to be hosted in Lyon, in a very special venue at the confluence of the two rivers of the city, and is going to deal with the convergences that are influencing the design practice nowadays. The conversation will start from the best-practices of interaction design to shift towards the systemic challenges we are asked to deal with today, and finally reflect on the role and responsability that we have in using technologies to shape new services and experiences. What role is data playing in today's design practices? How can online and digital footprints help us better understand the people we design for, in integration with traditional applied ethnography and user centered design techniques? Oblo is participating to the World Usability Day in Rome with a workshop that focuses on how to identify behavioral archetypes by analysing data extracted from online conversations. The session takes the opportunity to dig deeper in the issue of women abuse, in connection with the overarching theme of the conference: "Inclusion through User Experience". How can memorials rethink their visitor experiences in order to activate people for a better humanity? In this workshop, Roberta and Jason Uslazek will share the insights developed while working with the Kigali Genocide Memorial in Rwanda and introduce a model - called Inzovu Curve - to map and assess the visitor experience of museums and memorials. The model helps finding opportunities to turn that journey into a changing experience, leading towards action. From executing a task to shifting perspective: in a moment in which human beings are finally the center of attention of companies and professionals across all industries, the quality of research insights and design outcomes is often surprisingly flat, raising concerns around the value and relevance of what we do. Roberta shared a reflection about existing user experience practices and limits, as well as cutting-edge cases and examples.